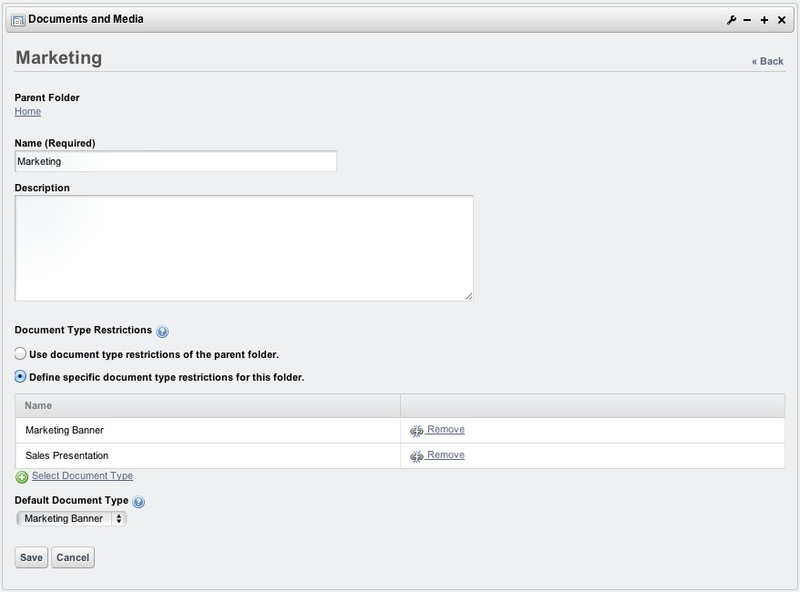 Whenever possible, Liferay 6.1 generates previews of documents added to the Documents and Media library. Out of the box, Liferay only ships with Java-based APIs to generate previews for documents. The only tool available that is 100% Java and has a compatible license to be distributed with Liferay is PDFBox. 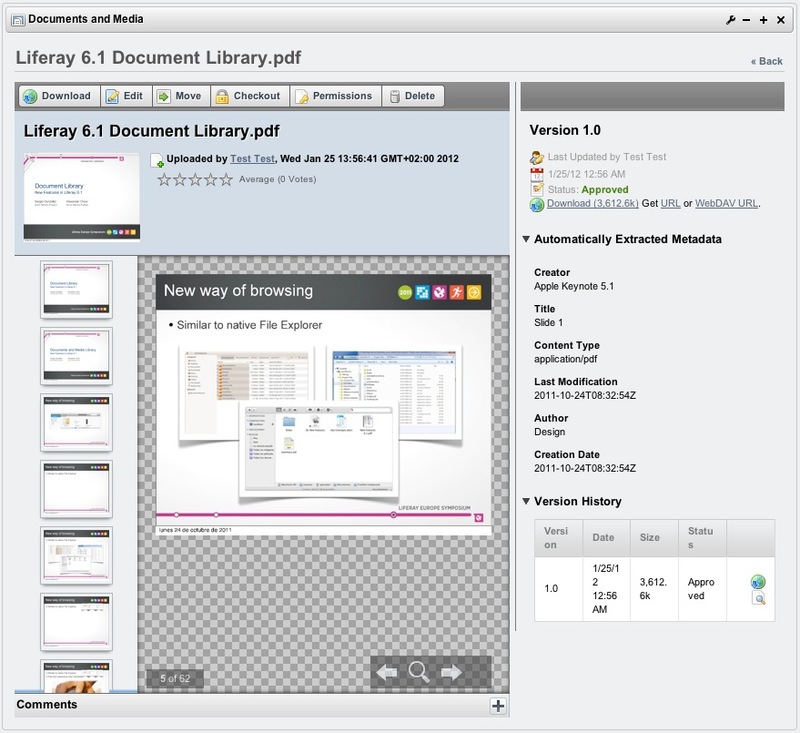 From a vanilla installation of Liferay 6.1, if you upload a PDF file to the Documents and Media portlet, Liferay will process the PDF in a separate thread to generate a preview. This process may last only a few seconds for a small file. The larger the file is, the longer it takes. ImageMagick and enable it in portal-ext.properties. While a default implementation of image generation for document previews and thumbnails is provided via PDFBox, you’ll need to install and configure some additional tools to harness the full power of Liferay’s Documents and Media library. These tools include OpenOffice or LibreOffice, ImageMagick, which requires Ghostscript, and Xuggler. With these tools installed and configured, Documents and Media content is displayed using a customized viewer depending on the type of content. Configuring Liferay to use OpenOffice or LibreOffice in server mode allows you to generate thumbnails and previews for supported file types (.pdf, .docx, .odt, .ppt, .odp, etc. ), lets you view documents in your browser and lets you convert documents. ImageMagick allows for faster and higher-quality previews and conversions. Xuggler allows for audio and video previews, lets you play audio and video files in your browser and extracts thumbnails from video files. Please see the External Services section of chapter 16 for instructions on how to configure Liferay to use these tools. You can view a document with a customized viewer that allows you to navigate through the different pages of the document and read its content. You can view a multimedia document (audio or video) and play it online. If the browser supports HTML5, it uses the native player of the browser. Otherwise it falls back to a Flash player. Document previews are powerful and help users browse media more successfully to find what they’re looking for. When adding new documents or viewing existing documents, a process is triggered automatically that extracts the file’s metadata. The library used by this process is TIKA and it’s already included in Liferay out of the box. You can see the metadata when viewing the document, in the right side of the window. You can force users to add only certain document types to a folder. By default, child folders inherit the restrictions of their parent folder. 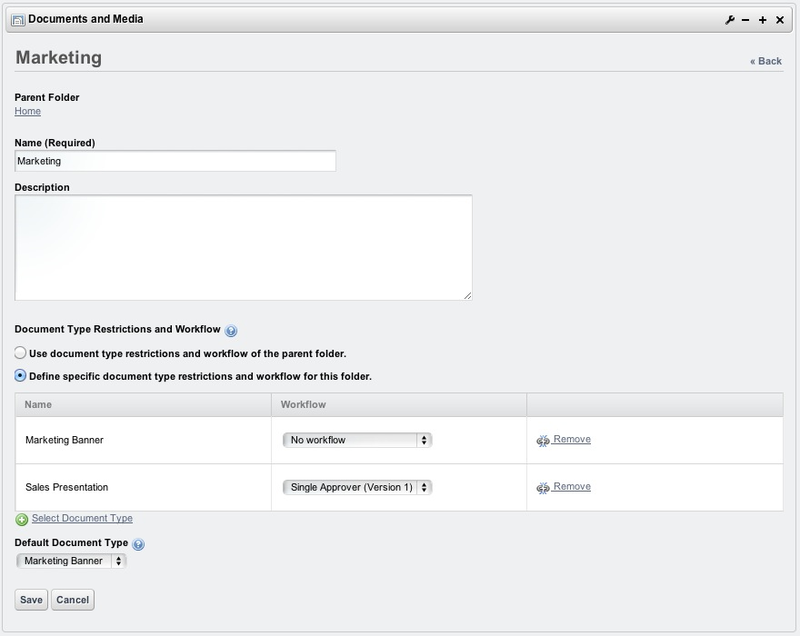 You can change this behavior by editing the folder and selecting the allowed document types. Document types are a powerful way to enforce rules for documents uploaded by users. Next, we’ll see a way to make it incredibly easy for users to access documents stored in Liferay’s Documents and Media repositories. 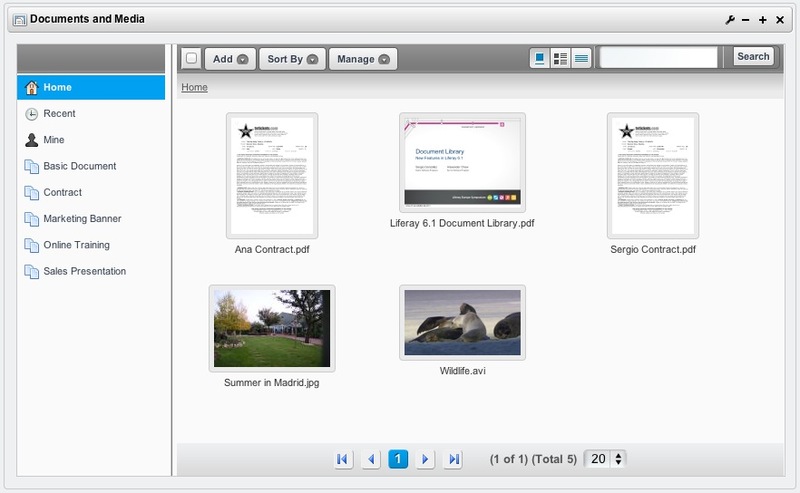 Wouldn’t it be great if you could access documents and folders belonging to Liferay’s Documents and Media library from your own machine’s file manager? You can, thanks to the Documents and Media library’s WebDAV integration. WebDAV stands for Web-based Distributed Authoring and Versioning. It’s a set of methods based on HTTP that allows users to create, edit, move or delete files stored on web servers. WebDAV is supported by most major operating systems and desktop environments, including Linux (both KDE and GNOME), Mac OS and Windows. Suppose you’ve created an Image Gallery folder using a Documents and Media portlet and uploaded some images to it. Portal users with the appropriate permissions can access this folder, and the image files it contains, using a browser and Liferay’s web interface. WebDAV provides an alternative way to do this using a file manager instead of a web browser. To access a folder stored in a Documents and Media portlet on a remote server, you’ll need log in credentials for the portal and the WebDAV URL of the folder you’d like to access. Next, navigate to the Documents and Media portlet hosting the folder you’d like to access. 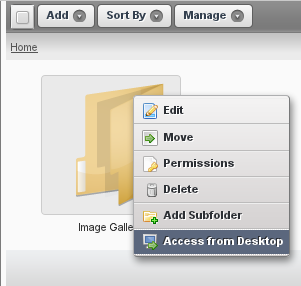 Mouse over the folder (Image Gallery for our example) and select Access from Desktop. Figure 4.18: Select Access from Desktop to get the WebDAV URL of a folder. Copy the WebDAV URL. On Windows, right-click on My Computer and select Map Network Drive. Select an unused drive, paste the WebDAV URL, and click Finish. You’re prompted to enter your Liferay credentials and then, provided you have the required permissions, the Image Gallery folder appears. You can now add, edit, move or delete files in this directory. On Mac OS X, select Go → Connect to Server in Finder. Then enter the WebDAV URL of the folder you’d like to access in the Server Address field, click Connect and you should be prompted for your Liferay credentials. On Linux, you must slightly modify the WebDAV URL of your folder in your file manager. For KDE’s Dolphin, change the URL’s protocol so that it says webdav:// instead of http://. For GNOME’s Nautilus, change the URL’s protocol so that it says dav:// instead of http://. Then press Enter and you’re prompted for your Liferay credentials. Note that Liferay increments the version numbers of files edited and uploaded via WebDAV so you don’t have to worry that using your file manager will bypass the functionality of Liferay’s web interface. The Documents and Media application is a powerful way to manage any types of files your users need to use. Next, let’s look at how you can leverage Liferay Portal’s Asset framework. Now you know just how easy it is to store your files using Liferay’s Documents and Media portlet. In the next section we’ll review some ways to organize and manage your assets so you’re getting the most out of your content.